Twinkle lights on front yard bushes. Pretty but they seem out of place without a reason, xmas for instance, to attach themselves to—a purpose other than simple loveliness during these still dark early evenings. My, how narrow we are. I am. A horse trailer without a horse. And in a neigh(pun not intended, but I like it)bourhood that can in no way accommodate a horse, secretly, in a backyard. Or in any way otherwise. 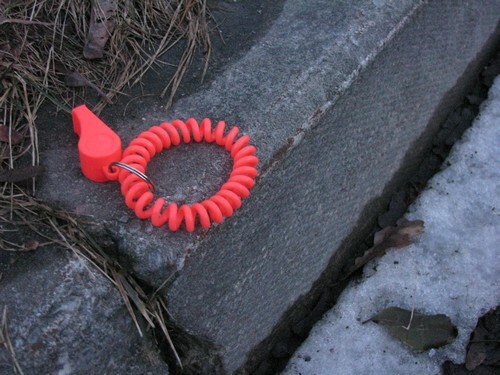 A bright orange wrist thingy with a whistle attached. I don’t like seeing this. Makes me wonder how it got detached from its wrist. And if it belonged to a child, when did we start making children wear whistles? And did wearing it [or worse, the need to wear it] make him/her [I suspect it was a her] feel safer or more afraid?